Video demo: Victor Novikov. 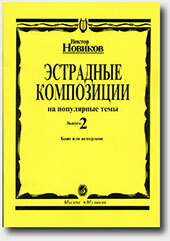 Concert Rondo "Forgive me Mozart!" Video demo: Victor Novikov. Serenade on the Theme by V.Solovyov-Sedoy "Evening Song". Video demo: Victor Novikov. French Ballade. Composition on the Theme by Joseph Kosma "Autumn Leaves" ( Les Feuilles Mortes ).